Before I go into the “boss-like” features that really stood out to me, I feel it important to quickly share how I approach my vehicle reviews. If you are looking for a deep, technical dive into a vehicle, this review is probably NOT what you are looking for. You might be better served by checking our auto publications like Road & Track or Car & Driver. But, if you are looking for how a dad and his family feel about day-to-day usage, the car tech, and how a vehicle may or may not fit into a family, then keep reading. That’s how I approach things. Yes, I’ve reviewed a lot of autos, and I know many features that I like (or dislike). So, you will get more of a gut-feeling type of review instead of a technical analysis. You have been warned! When I mentioned to my daughters that four of the five possible seats in the LS-500h would have built-in shiatsu massages, I knew there was going to be a fight over who would have to sit in the middle seat in the back. But first, they were simply amazed at the possibility of this option. And yes, it’s true. With the $23,000 Executive Package, you suddenly have the option to get a massage while you drive or are driven. Suddenly, my kids were riding like movie stars and my wife was being pampered in the front passenger seat. But what I really appreciated about this was the fact that the driver as well had the option of getting a massage. Because let’s think about who is truly doing all of the work here, the driver. So, it is only fair that they can experience the same luxury as all of the other passengers. As I mentioned, there is one seat that doesn’t have the massage, that of the middle seat in the back. This is because, while comfortable as my daughters can attest, it normally is covered by the drop-down armrest that has the full controls for the back seat and more. Truly, only four people will be able to experience the full “boss” luxury of this Lexus. There are many different settings available for the massage. You can do your entire back, bottom side, and legs, or you can strict it to specific areas. You can have it roll down or up. And, you can add heat to it (seats are headed via controls). After a set amount of time, the massage will stop. There is nothing better than rolling up to your destination relaxed and with a kneaded out back! I truly understand how the Lexus LS-500h is positioned as a luxury sedan. In fact, as we drove it, I thought about business executives or Hollywood stars using this vehicle as a go-to luxury sedan. Of course, you would really need also to have a chauffeur to take full advantage of it. And, of course, I became that chauffeur. Everything is controlled via the rear armrest touch-screen control. But once you recline and extend the ottoman, you are indeed in the lap of luxury…literally! I got to try it just while we were parked, ah, the hardships of being the driver. But once you park and get ready to exit, the seat will automatically go back into an easier position to exit the vehicles, perfect for making your entry onto the red carpet and greet the media. You don’t become a boss without knowing how to save a penny here or there. So, when I was asked if I wanted to test drive the hybrid version of the LS-500, of course, I said YES. And, on top of that, hybrids are much better for the environment than pure gas-guzzlers. One thing that I was curious about, however, was if performance would be impacted given the size and weight of the LS-500h. Indeed, it was not. We averaged about 29 MPG which included both city and highway driving. This is almost the same as the two non-hybrid, smaller cars that I own. So I was impressed. The 2019 Lexus LS-500h is powered by a multi-stage ECVT with automatic transmission. It’s a V-6 multi-stage hybrid drive that puts out 354 total system horsepower. Our vehicle was a rear wheel drive version that had an estimated 0-60 of 5.1 seconds. While the non-hybrid model had higher horsepower (416) and a 4.6 second 0-60 MPH time, it’s MPG was much lower (19/30/23 versus 25/33/28). I found the hybrid to be fast enough for me. And my family really didn’t like me doing acceleration tests that much. But it definitely pushed people into their seats! Nothing defines luxury than leather. And when you, as a driver or passenger, settle into the supple leather seats, you are embraced by them. Literally. As I mentioned, the seats are heated, even the back ones. But they are also ventilated which means that they can cool you as well on hotter days. It’s always nice to have that option. One thing that was particularly nice about the front seating was the number of ways you can adjust the seats to your liking. In fact, the front seats can be adjusted via a 28-way control. So it is practically impossible to NOT get comfortable in the LS-500h. The rear seats, with the executive package, have 22 ways they can be adjusted. Many of the seat adjustments for both the front and the rear can also be controlled via the screens. In the rear, the touch-screen in the armrest gives a lot of control. And in the front, you use the innovative trackpad to dial in your seating comfort. I already mentioned the hybrid engine earlier. But I thought that I would call out the fact that the LS-500h is built for speed as well, all while providing an extreme level of luxury. All electric vehicles tend to have a lot of torque and pretty darn snappy acceleration. But hybrids, at least in some of the lower-end models, don’t tend to be very peppy. This is quite the opposite with the Lexus LS-500h. It’s fast. And you don’t have to worry about being left in the dust when you stomp on the accelerator. There is a nifty little dial, right on the top of the dashboard in front of the driver. Just dialing it slightly transforms the LS-500h from a comfortable, eco-cruiser into an aggressive sporty sedan. Based on the setting you choose, the drive either softens or stiffens. The engine is a 10-speed, all either automatically controlled, or, if you feel ambitious, can be manually controlled via the paddle shifters behind the steering wheel. As you shift into sport mode, the driver’s dashboard transforms, even complete with a bright read tachometer so you can rev things up. The Sport S mode makes the engine much more responsive, with the S+ mode, even more so. In the Comfort mode, the ride is much softer, and you feel fewer bumps in the road. In ECO mode, the engine is optimized for fuel efficiency. And if you want to, you can customize things in your own Custom mode. The suspension is dynamically controlled based on the drive mode. With the hybrid version, if you plan on going short distances and at low speeds, you can go in purely EV (electric vehicle) mode and not use any fuel at all. For our driving, when I had the family in the car, I tended to alternate between Comfort and ECO mode, with my preference between the two being the Comfort (like a boss) mode. But when I was on my own, I pretty much kept things in the S mode and definitely had some fun with the paddle shifters and having a heavy foot. But, assuming you don’t have anyone sitting in the middle seat, you DO have a full control center at your beck and call. You have full back seat environmental controls, can adjust the seating positions, can initiate one or many massages, can turn on or off the overhead lighting, and even adjust the shades (see section below). And there is one thing I had mixed feelings about in particular. The rear seat can control the audio of the entire vehicle. If you have kids in the back, they can control what music is played and at what volume. This feature makes sense if you have a bunch of adults in the car. But with my kids, even though they are teens, suddenly songs I wanted to hear were being skipped, and volumes cranked up (or down) in pretty much the opposite way I was trying to do it. No matter. If you are seated in the rear seats, you are the boss (unless of course, my wife is in the front seat, then she is). When you are “the boss” and are sitting in the back seat, you probably want some privacy. While this is usually accomplished through the use of tinted windows (that’s what we do on our cars), sometimes you don’t want the windows darkened all of the time. It’s hard to see in AND out with tinted windows. The 2019 Lexus LS-500h has an excellent solution for that. Its got motorized window shades for all of the back side windows and the main rear window. Now I have driven vehicles where the window shades are manual, and they are just lifted up to hook on the top of the window. Not true in the LS-500h. Everything is motorized. I mentioned that my kids liked having control over the tune from the back seat armrest controller. And there was a big reason for this. This Lexus came with the Mark Levinson Quantum Logic audio system. I have to admit, I loved it as well. This audio package upgrade is about $2000 extra. But if listening to music is something that makes your driving better, it’s a highly recommended upgrade. With this audio upgrade, throughout the cabin are 23 carefully placed speakers. The whole system is rated at 2,400 watts which means that when you want things loud, it’s thunderous. But what truly struck me was the sound isolation, meaning that the fidelity was so clear, you could almost visualize certain instruments virtually appearing in front or behind you. It was truly immersive. I have test driven many vehicles with powerful sound systems, but this one, in the LS-500h, was one that was almost like “being there.” And, it isn’t just the driver that benefits from this enveloping sound, all of the other “bosses” get even distribution. And, you can easily configure where, exactly, you want the focal point to be for the music. It could be the driver, everyone, or the lucky “boss” in the right rear seat that is reclining. One of my current cars has a stereo with Apple CarPlay built-in, so I know how great it is to have that capability. Having Siri read and respond to texts without you as the driver having to take your eyes off the road is a great safety feature. And, while this Lexus did have a full-featured navigation system, I like having the possibility of using Apple maps, Google maps, or even Waze as my primary navigation. But one thing I truly enjoyed about having CarPlay built in, was how it took advantage of the large display of the Lexus LS-500h. Because the display was wider, you could see more apps and using a navigation app spanned the full real-estate of the 12.3” screen (yes, it’s that big). The one thing that took a little bit of time to get used to was Remote TouchPad. Over the week, I learned how to glide my fingers across this pad to navigate various menu items. It does provide feedback as you navigate through menus or other options. If you can use a smartphone or tablet, you can use the TouchPad, and even use pinching, swiping, and flicking to control many aspects of the vehicle. But, you can use the TouchPad to navigate and use any of the apps that appear within CarPlay. Another thing that the HUD would display is cross traffic warning. These appeared as large orange arrows that indicated where the cross-traffic threat was potentially coming from. This was particularly helpful in intersections, alerting you of potential red-light runners. I mentioned lane detection. This Lexus also can “keep you in line” (literally). If it detects that you are drifting out of your lane, you get a vibration warning and even a slight nudge of the wheel to get you back on track. You can view the lane detection status on the HUD as well. The Lexus can also detect various street signs like stop signs or speed limit signs and these are projected on the HUD as well. Using radar and cameras, the LS-500h has adaptive cruise control. I love this feature as you simply set your desired speed as well as the distance you are comfortable to have the vehicle in front of you at. Then the Lexus automatically accelerates or decelerates to both keep the padding as well as get to that speed that you want. Lastly, one more smart feature was the intelligent high beams. When you turn this setting on, your high beams will go on only when the LS-500h detects that there isn’t a car coming towards you. If a vehicle is detected, it will automatically lower the high beams. Attention to detail. That’s what the boss looks for, and that’s what they get with the 2019 Lexus LS-500h. As many of the features I wrote about earlier underscore Lexus’s attention to detail, there are many other items that I haven’t touched upon. Things like rear seat lit vanity mirrors (which made my daughters happy because they could fix their makeup easily), to soft-touch reading lights, to the premium trims, to the great legroom throughout the cabin – all of these things earned high marks in my family’s book. Or what about the leather-trimmed everything (steering wheel, assist grips, trim, etc.) Or the panoramic view assist for when you are trying to do that perfect parking job. Or the ambient lighting throughout the cabin which was visible but definitely not blinding or in your face. Much of the interior surface designs are actually hand-crafted, adding to that level of elegance. And other accents carried across from the front seats to the back, creating a cohesive design throughout. The Kiriko cut glass which could be found on the dash and doors issued a subtle brilliance. According to Lexus, there are 147 points of polishing required to get this elegant look which transformed depending on the lighting. Truly, you could easily feel how much attention was made to the design and the details inside and outside the vehicle. My words probably don’t do it justice. So in addition to the photos in this article, you can see photos on my Flickr album. Toyota/Lexus has a tagline “Find New Roads” which is definitely appropriate with the 2019 Lexus LS-500h. This car made us want to get out and drive. It made my kids feel like movie stars. And while I have to be honest here, the price of the LS-500h as we tested it ($116,010) is not something that everybody can afford, the time we did spend in this vehicle was definitely exhilarating yet relaxing. It gave us a glimpse of what hard work could potentially achieve. Something to “drive” towards. Disclosure: Apart from the multi-day loan of the Lexus LS-500h, I have not received any compensation for writing this content, and I have no material connection to the brands, topics, and/or products that are mentioned herein. All opinions within this article are my own and are not subject to the editorial review from any 3rd party. More information can be found in my About page. 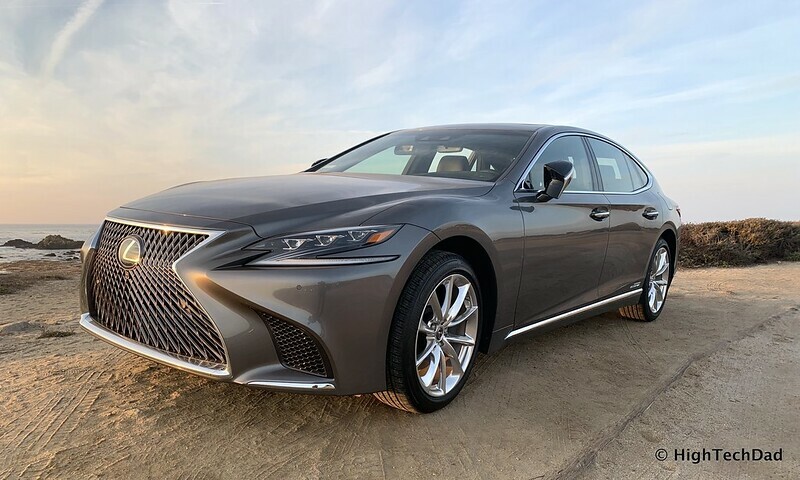 HTD says: If you genuinely want to experience what driving “like a boss” is, get behind the wheel of the 2019 Lexus LS-500h luxury sedan. I guarantee you will be awed by the features, the tech, the performance, and the comfort of this high-end vehicle.